In years when walnuts have a lower value, it is important to produce quality, light-colored kernels to maximize profitability. Here are some suggestions for producing high quality nuts. Irrigation management. Water management is a key element to producing good yields of high quality walnuts. Excessive tree stress from either over or under irrigation has a direct effect on crop quality. Farm advisors Allan Fulton and Richard Buchner (2003 to 2005) investigated three irrigation treatments: 1) little to no trees stress with trees maintained at – 6 bars, 2) mild water stress increasing to about – 9 bars at harvest and 3) moderate water stress increasing to about – 12 bars at harvest. We found that water stress reduces walnut yield and impacts quality by favoring darker kernels. Many tools, from soil based to climate based to plant based are available to help with water management decisions. Additional information is available from Allan Fulton and you can also check our weekly ET reports and publication on using pressure chamber technology for walnut, almond and prune irrigation. 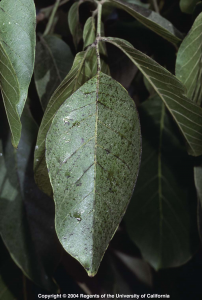 Sooty mold on walnut leaves following an infestation of aphids. Photo: UC ANR. Insect damage. Insects and mites all have a large impact on walnut quality. Leaf feeding by spider mites causes leaves to desiccate and drop. Defoliation early in the season greatly reduces nut yield and quality. Defoliation late in the season interferes with harvest. Aphid feeding can reduce tree vigor, nut size, yield and quality. In addition, aphids excrete honeydew which turns the husk surface black. Sooty mold also develops on the honeydew on the husk increasing the chance for sunburn. High populations of aphids may cause leaves to drop exposing more nuts to sunburn which darkens or shrivels kernels. Scale insects feed on phloem sap, weakening or killing fruit wood and are associated with Botryosphaeria which infects wood, spurs and nuts reducing yield and killing next year’s buds. Codling moth and navel orangeworm directly damage kernels through feeding and provide good entry points for additional kernel damage. 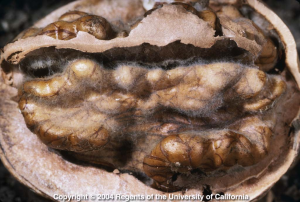 Finally, walnut husk fly infestation early in the season (late July to mid-August) leads to shriveled and darkened kernels or may induce mold growth. Late infections tend not to damage the kernel but may result in shell staining. Managing sunburn with kaolin particle films. Kaolin particles form a protective white film that reflects the sun resulting in cooler trees and less sunburn. Studies conducted by Farm Advisor Kathy Kelley Anderson over a four-year period in Stanislaus County compared untreated and kaolin treated trees (three applications of Surround at 50 lbs in 200gal of water /acre) in well managed Vina, Howard, Tulare, and Chandler orchards. The quality of harvested nuts was evaluated by Diamond Foods and showed that the white coating increased the relative kernel value in some varieties. Quality and value increases were consistently seen in Vina. Improvements in Howard and Tulare were more variable while Chandler value was not increased in any of the years. Beware, the material and application costs of multiple full canopy sprays can exceed the increase in crop value when calculated on a 60 cent per pound basis. Feasibility improves with increasing nut prices. Kaolin usually needs to be applied early enough in June, before high heat, to have the best results. Moldy walnut kernel. Photo: UC ANR. Avoid, as much as possible, pre-harvest hull damage and moisture stress. Harvest as close to hull split as possible. 80% nut removal with 95% hullable is considered an economic harvest. A second shake will recover the remaining nuts. Ethephon is often used to promote early or once over harvest. Do not apply Ethephon to stressed trees. Once harvest begins, pick up, hull and dry nuts as soon as possible. Most loss of quality occurs during the first nine hours after shaking. This is particularly true if air temperatures are high at harvest or nuts are in direct sunlight. Walnuts left on damp ground are more susceptible to mold damage. Drying nuts quickly after pick-up also helps to reduce kernel mold. Double shake may be an option. Harvesting near the beginning of hull split increases the percentage of light-colored kernels and decreases the incidence of insect and mold damage. Since hull split does not occur at the same time throughout the tree or orchard, one solution is to double shake. The first shake will harvest the high quality early nuts and a second shake 7-10 days later will get the remaining crop. Not everyone has the equipment or harvest plan that allows for a two shake harvest. Individual growers need to decide if the higher quality equals or exceeds the cost of the second shake. Harvest aid. In the Sacramento Valley walnut kernels are mature and at their highest quality several weeks prior to hull split. Unfortunately, commercial harvest is delayed until adequate hull split allows good crop removal. Walnut kernels are lightest in color and of highest quality when the packing tissue around the kernel halves just turns brown (packing tissue brown or PTB). Applying ethephon, a synthetic version of the plant growth regulator ethylene, shortens the time between optimum kernel maturity and hull split. Ethephon is an ethylene based plant growth regulator applied to accelerate hull split. Many walnut growers successfully apply ethephon (Ethrel) to manipulate harvest timing. One approach for ethephon use involves applying ethephon at 100% PTB. This promotes harvest about 14 to 23 days after application, 7 to 10 days ahead of normal harvest. Nut removal is about 90 percent. A second harvest is often economical. Another way of using ethephon involves applying it about 10 days prior to the normal harvest date. This increases the proportion of harvested nuts and hull removal so that a second harvest is usually not economical. Good results with ethephon requires experience. Additional information is available here.